Dryers are the number one source of fire in the home and we use them a lot. Lint will collect and build up slowly and gradually without us even realizing it. Cleaning out the air filter after each use does nothing to clean the dryer vent. The lint forms from the clothes when the water is removed during the drying process and will start building up on the crevices deep inside the lint filter trap and all along the dryer vent hose. In 1999, the U.S. Consumer Product Safety Commission (USCPC) reported that out of 15,000 fires studies in a year, electric dryers were over 2.5 times more likely to cause fire than gas dryers. And the fires started in either the dryer venting or the lint trap. You may be having lint buildup if your clothes are not completely dry when the cycle ends or clothing takes longer and longer to dry. Other signs could be that clothes feel hotter than normal when the cycle is completed or the flapper on the inside does not open which means low exhaust. If the outside of the dryer gets very hot, a burnt smell is noticeable in the laundry room or the laundry room is becoming more humid than normal; lint may be building up. It’s a good idea to hire a professional to clean your dryer vent as they have the know-how. The dryer will need to be moved and the gas or electrical lines will need to be disconnected. Trained technicians do this on a daily basis so it’s worth the added cost to keep your appliance and your family safe. If a professional happens to damage your dryer when they’re working on it then the cost is on them, not you because they are bonded and insured. A wet-dry shop-vac isn’t enough to do a thorough cleaning. Professionals have specialized equipment that makes the job easier and more efficient. The U.S. Fire Administration recommends that dryer vents be cleaned once a year to reduce the risk of fire, gas leaks and a large energy usage for operating your dryer. Contact the experts at Leading Carpet Cleaning for your next dryer vent cleaning. Filtration soiling is not a defect in your carpet and has nothing to do with the quality of carpet you have and will look worse on lighter colored carpet. It’s caused by dust and other airborne pollutants that accumulate on the surface of the carpet that have a concentrated airflow over the carpet or through tiny cracks or other open areas under the carpet. Filtration soil appears as dark or grayish lines on carpet along walls, stairways and under doors. It can happen quickly or over time depending on the quality of air flow and the level of pollutants in the air of the home. When the air gets warm with a furnace running the air that is full of pollutants, goes up and then locates cooler surfaces like an outside wall or a different room. The concentrated air will usually be from an upper level to a lower level of a house. It will happen under closed doors when the heat or AC is running. When the warm air moves toward the cooler area, it will push its way through the surfaces that are carpeted and “clean itself’. This allows a buildup of oily soils that get left behind in the carpet that are very difficult to remove. The oily suds are so small, forming an electrical bond. They can become embedded onto the fibers that are designed to hold the color of the carpet known as “dye sites” making filtration soil so hard to remove using carpet cleaning solutions alone. You can attempt to clean filtration soiling with a brush and a mild carpet cleaning solution. Gently rub the stain back and forth with the brush after the cleaning solution has been applied. When the stains start to become loose, you can blot the debris with a towel. Using clean water, repeat until the towel is no longer picking up any residue. If this works you’ve just figured out how to clean the stains yourself. But this is usually not the case. These stains go very deep into the carpet making it a good idea to call a professional. When you have healthy, filtrated air circulating through your home whether heating or cooling, you reduce the chances of having these stains develop. Improper air flow happens when the ventilation system isn’t running properly and exceeds the system’s ability to remove the air from the room resulting in the air finding its way out in gaps along walls and stairways. Try to keep interior doors open and seal off air spaces around doors or along baseboards with caulk. 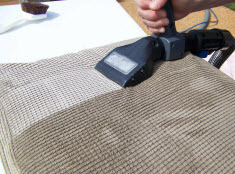 After you have your routine professional carpet cleaning, consider having fabric protector applied. Having dark filtration lines in your home can become an eyesore. The only way to clean them is to get deep down into the carpet. The total removal of the stains can be complicated and will depend on the contaminants that are causing the stains. Quality hot-water extraction combined with the experienced technicians at Leading Carpet Cleaning will get your carpets looking like new again. Contact us for all your floor and furniture cleaning. When your carpet has stains, it can make your home look dingy. Scrubbing it yourself takes time and effort … and often causes more damage. The easiest way to keep your carpet looking new and fresh is to prevent stains from getting there in the first place. – Stain Resistant Carpet: The best thing to do from the start is to have stain-resistant carpet installed in your home. Most of the carpets on the market have been treated with a stain-resistant chemical. If you purchase carpet that is not stain-resistant, then you can purchase a product and apply it youself. Stain-resistant carpet will not prevent all stains, but it will do a great job at protecting it and will make stains easier to remove. 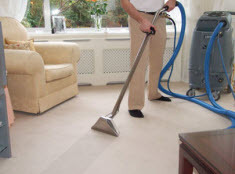 – Vacuum Often: Another way to protect your carpet is to vacuum it frequently. Dirt can be abrasive to your carpet and will cause damage and permanent darkening over time. It helps to remove dirt and debris that you are not able to see. You can purchase plastic carpet-runners for high traffic areas as they will attract dirt faster than others. They are clear and made of non-slip plastic or rubber. They have “feet” or “teeth” to keep them in place on your carpet. These can be an asset if you have children and pets running around and are inexpensive too. You can rent steam cleaners to clean your carpet but carpet runners will prevent the stains in the first place. While there is not a lot you can do to prevent spills, you can defiantly control the damage that spills will create by attending to them quickly. Never rub anything on the spill as this will cause the liquid to set into the fibers and cause a stain that will become permanent. The best way to tackle a spill is to use a clean towel to dab up any excess moisture. Chances are that cold water and a towel or cloth will get most of the spill up. If this is not successful, you can use a spray or powder stain remover. It is very important to follow all directions to make sure you avoid more damage to the carpet. If you are attempting to remove old stains, then you will need to tackle them differently. Taking good care of your carpet is always a good idea, but have them cleaned professionally and regularly. Doing it once a year is enough unless you have pets and/or children. You will need to have them cleaned more often. Professional carpet cleaners are great at protecting your carpets from future stains. You can ask for specially manufactured cleaning agents to be applied to your carpets. These work by protecting the carpet fibers from wear and tear, not to mention helping with stains and spills. It’s a good idea to have these applied after each professional cleaning. Think of carpet stain protection as an invisible shield against stains. Having it applied will allow you to keep your carpet looking fresh and new longer and will save you money in the long run. If your carpets are looking older than they are, contact Leading Carpet Cleaning to have them professionally cleaned and treated for future stains. We spend about a third of our lives on our mattresses. We should make sure they’re the cleanest they can be because dust mites can produce roughly two times their body weight in waste-yuck! A clean mattress will also allow for a more pleasant and productive night’s sleep. Do you ever wonder why your mattress gets heavy as it ages? Years of accumulating dust, dead skin cells, insect parts, bacteria, mold spores and animal hair is the reason. When we sleep, we sweat and shed millions of skin cells. Our sweat causes odors and staining and the oils from our skin will build up and wear away the mattress top. Imagine that your mattress is a huge air filter with anything falling on it being pulled in deeper with the force of gravity. Mattresses can be expensive, so consider having it professionally cleaned to make it last longer. 1. Pre-inspection is the most important step. This is where the technician will inspect the mattress and look for stains and areas that need special attention. Heavily soiled or stained areas may need extra time or a different cleaning product all together. 2. Vacuuming should never be skipped. The technician will do a dry vacuum of the mattress to lift as much dirt and debris as possible out of the mattress. 3. Pre-spray with the use of a mild cleaner that is designed for fine fabric. Your health should be the first priority and therefore harsh chemical should not be used where you sleep. Hot water combined with the correct cleaner will immediately begin to break down dirt and debris deep in the mattress. 5. Dwell time is the length of time that the solution is left on the mattress to suspend and break down oils before rinsing. Dwell time is typically 10-15 minutes. If this step is effective, then the next step will have better results. 6. After the cleaning solution has worked its magic it’s time for a rinse. 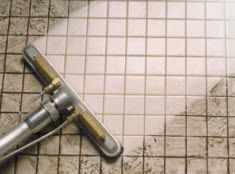 The rinse step will not only remove the cleaning solution but the broken down dirt and debris. Tis happens with a gentle rinse solution combined with hot water. The technician should use an upholstery tool as it has great suction and won’t over-wet your mattress and reduce drying time. 7. Without fans the dry time will be anywhere from 8-12 hours and 4-6 with them. You can help speed up the process by turning up the heat or A/C depending on the weather. Your mattress should be cleaned twice a year and vacuumed more often to keep it fresh. To get your mattress freshly cleaned, allowing you to sleep more peacefully call Leading Carpet Cleaning today.